Record-marking time for teachers mean two days off of school for Cameron. And for Oma, that meant two extra days of Cam-time! Fun to make and delicious to eat. While cleaning out the freezer, we spied some frozen cookie dough that was ordered from Cam's school and decided that since the apple treat was healthy, a chocolaty treat would be o.k. However, we did need to wait for it to thaw. Cam definitely decided it would be fun to pretend to take a big bite of the dough. Jane & Cam attempt a "selfie"
The weekend brought more snow, cold temps, and a requirement to get in additional sledding. The plastic tubes travel fast along the frozen front yard and since we're at the end of the street, there is virtually no traffic. As we all giggle and scream the entire ride down the track, the second it ends, Cam is asking for more. We were fortunate to spy a red fox tracking across the backyard as well as our favorite neighbor girls who ventured over for some playtime with Cam too! The cold is definitely here to stay awhile, so we're quite certain there will be more sledding to come. 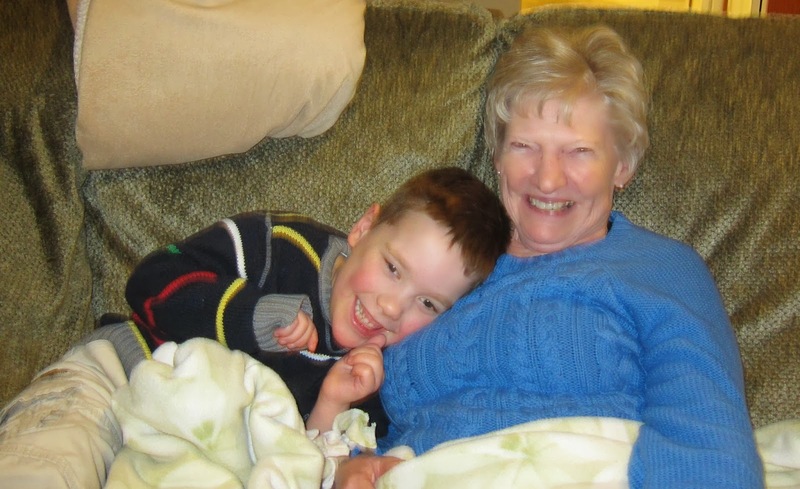 We are incredibly thankful to Cam's Oma who extended her stay with us due to the inclement weather. We were blessed to have the extra time with her, providing us with more moments, hugs and stories.